We text, tweet, and Snapchat one another all the time, but we never call one another, making it a bit of an odd request. So Amanda and I figured it had to be really exciting news for Carly to request a phone call because just reading the news through a text would not live up to its importance. Two minutes later, we called Carly from Amanda’s phone. And sure enough, Carly had exciting news. Carly called to let us know that Jamie Tworkowski, founder of the non-profit organization To Write Love on Her Arms and New York Times bestselling author, would be coming to our school, the University of Illinois at Urbana-Champaign, this school year. 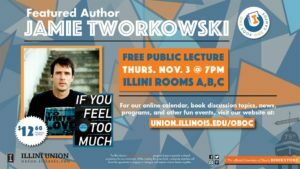 His book If You Feel Too Much was selected for the One Book One Campus event, so he would be coming to U of I to do a lecture and book signing. The expanded edition of If You Feel Too Much would also be out by the time he came, too. We could not be more thrilled, because we all love Jamie. In June 2015, we were all fortunate enough to meet Jamie at the Chicago (really Naperville) stop of his first book tour. So it’s not as if we hadn’t all already met Jamie, but that didn’t stop us from being excited. This time would be different. This time would be even better than Naperville. Amanda, Carly, and I are all on the executive board at the TWLOHA UIUC UChapter. As such, we are the leaders of a group of students whose duty is to help carry out TWLOHA’s mission at our particular school. It’s one of the reasons we’re friends, and it’s one of the things we often bond over. As members of the UChapter, it was particularly special for us to have Jamie come to our school. The Chicago stop of the book tour was very general. The target audience was simply that of people who support TWLOHA, ideally from that area or somewhere in the surrounding states. 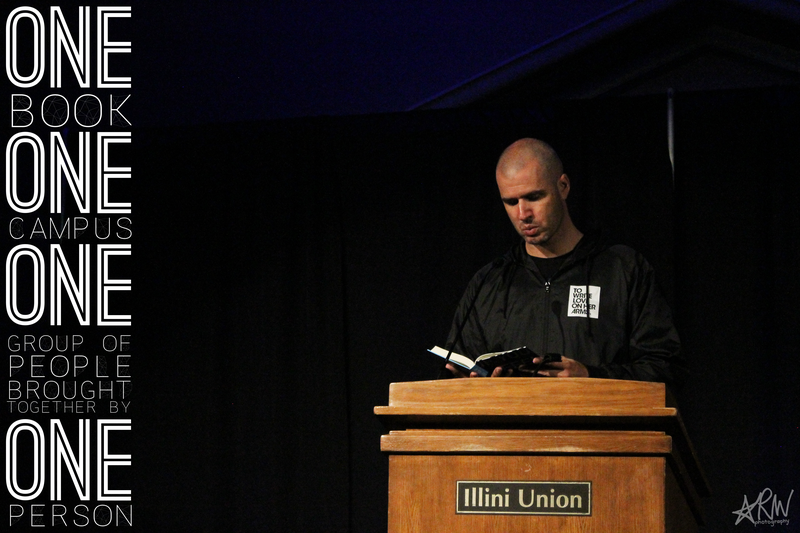 But the One Book One Campus event, although open to the public, is specifically catered to the U of I community. Representatives from the university create a list of books for the Chancellor to select as the “One Book One Campus” book. This year, If You Feel Too Much was chosen. So Jamie would be coming to campus to address this specific community, and we were a unique group within that community. And, as member of the UChapter, we would get to play a special part in helping make the event a reality. Ever since Carly told me in June about the event, I had been counting down the days to it: November 3. It was one thing that has kept me going through the fall semester, which has been a little difficult as a senior who just wants to get through the stress of college. i’ve never taken a razor blade to my skin, but i’ve certainly hurt myself. i’ve hurt myself and i’ve hurt other people in dealing with things that i’ve felt haunted by. i’ve never cut myself, but i don’t think i’m so different from someone who has. I’m not sure how well-received the idea was, but, for me anyway, it served as a good refresher as to what content is in Jamie’s book. Jamie flew into Illinois on late Wednesday night/early Thursday morning, the same night as game seven of the World Series. At school, a lot of the students, myself included, are from Chicago or the Chicagoland area, so many students are Cubs fans. And there are even plenty of central Illinois residents who root for the Cubs. 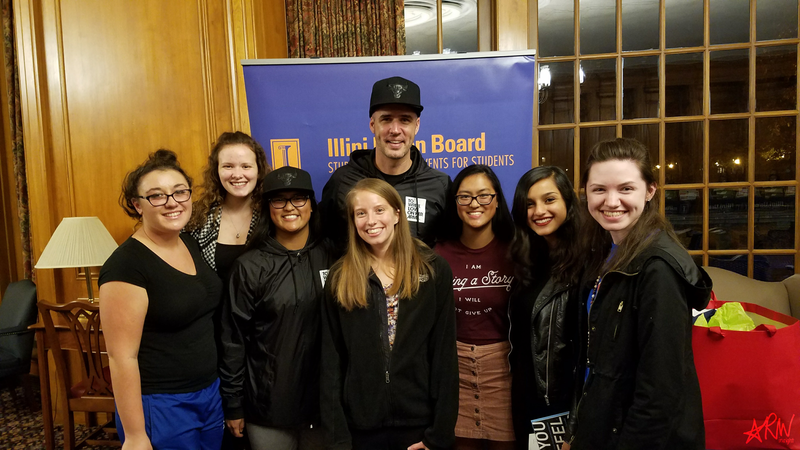 So, with the Chicago Cubs in the World Series—and on the brink of winning their first championship in 108 years—there were many people at UIUC excitedly and anxiously watching the game. When the Cubs won, people were ecstatic. Masses of students flooded the streets in celebration. I was happy, too, despite being a Chicago White Sox fan: The championship was well-deserved; a long time coming; and gave such elation to many people, young, old, and in between. But my happiness for the Cubs was nowhere near the excitement I had that there were less than 24 hours until the One Book One Campus event featuring Jamie. On a plane headed to Illinois. Upon landing, i plan to buy a Cubs hat and join the many people crying and hugging. I was a little upset, because I didn’t want Jamie to wear a Cubs hat. If he was going to wear any hat to show support for a Chicago sports team, I wanted it to be the Bulls considering I’m a die-hard fan of theirs. 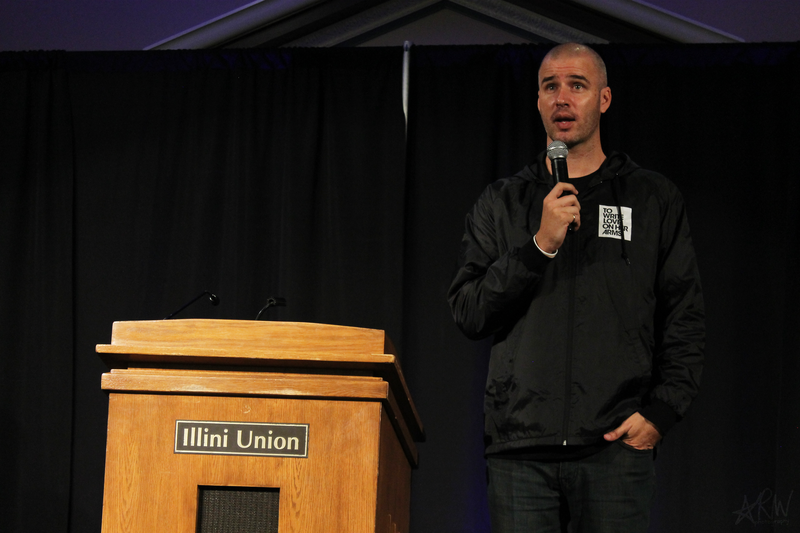 Jamie was really feeling the love for the Cubs, though, and wanted to celebrate that with us, everyone who took the time out of their days to spend the night with him at U of I. While sitting in the very front row on the right side of the room in the seat closest to the middle aisle, I listened to Jamie speak about how special it was to be among some of the people who appreciate the Cubs’ achievement the most. I found this particularly interesting, though. When Jamie came to Naperville, the Chicago Blackhawks were playing in the Stanley Cup Finals, and he mentioned how he was rooting for them over the Tampa Bay Lightning despite his being from Florida. So he had been among Blackhawks fans during their championship run as well. After realizing this, I thought about how Jamie should come back to Illinois around the time of the NBA Finals, because maybe it’ll mean the Bulls will be competing for a championship. Jamie’s lecture focused on his book and what TWLOHA does. But it was more than that. He showed his personality well, well enough for someone who didn’t really know him to figure out what kind of a person he is.
.@jamietworkowski: Where do you live? He told us about his first ever book tour stop and how no one clapped after he read a story from his book, but we did clap; he said he was glad we did. He commented on how everyone would occasionally giggle while he was reading parts of If You Feel Too Much and how it was the equivalent of applause. He would ask those who asked a question during the Q&A session if his answer sufficed because he wasn’t sure if it did. He continually told us how great of an audience we were. During the lecture, Jamie read a couple of stories from his book. Before reading each one, he would say a little introduction to lead into the reading of it. Apparently reading If You Feel Too Much five times makes it so you know the content well enough to know its general context. 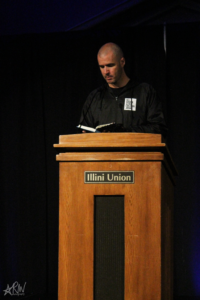 Because the One Book One Campus event was open to the public, some of the attendees weren’t UIUC students. Some members from the Illinois State University UChapter came to the event because Illinois State is only an hour away from U of I. They visited us at the information table we set up at the book signing. It was nice to speak with UChapter members from other schools and bond over this connection. It turns out the ISU UChapter has their general meetings every other week on Tuesdays. So do we. On the weeks the ISU UChapter doesn’t have meetings, they do social events. Or at least it tries to. The ISU members admitted they had been slacking on that part, saying it can be difficult to find the time and energy to do social events. We, too, have that same situation. In the lecture, Jamie mentioned how people had bought 10 copies of his book to give to their friends and family. When I heard that, I instantly turned my head to the right to face Amanda, who was sitting next to me. We didn’t even have to say anything to each other; we both knew what the other was thinking. Is Jamie talking about us? We thought it was plausible because we’ve tweeted him about buying multiple copies of his book for both us to have and to give to friends and family. Later that night during the book signing, Amanda had the four copies of If You Feel Too Much Expanded Edition that we bought for some of our friends. One of them was for our friend Sofie. She’s a Kyle Korver fan like Jamie is, and she went to Naperville with us to meet Jamie. 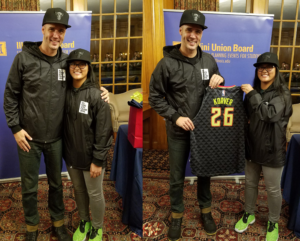 At that book signing, Sofie had him sign the page of the book with the photo of the Kyle Korver jersey, so I told Amanda she had to make sure Jamie signed that page. Jamie and I during his book signing in Naperville in June 2015. 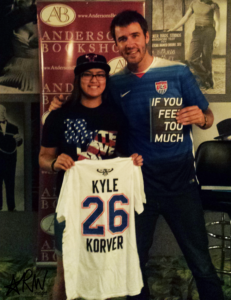 I brought my Kyle Korver shirt so I could let him know I’m also a fan of Kyle. I was standing back, away from the table waiting for it to be my turn when I told Amanda about it. Jamie was listening, and so I told him Sofie said hi and that she was at Naperville, too. Soon after, it seemed as if he remembered me somewhat, and I introduced myself to him in the weirdest way I possibly could. In Naperville, Jamie saw that I had a Kirk Hinrich phone case and asked if I was hinrichbullsfan on Instagram, adding that he had recognized the username from comments on some of his photos. I’ve since changed my Instagram username, but I tweeted Jamie to let him know so he would know I hadn’t gone anywhere. I accidentally never actually re-introduced myself to him as “Ashley” because I’m awkward and got caught up in my excitement. My apologies, Jamie. 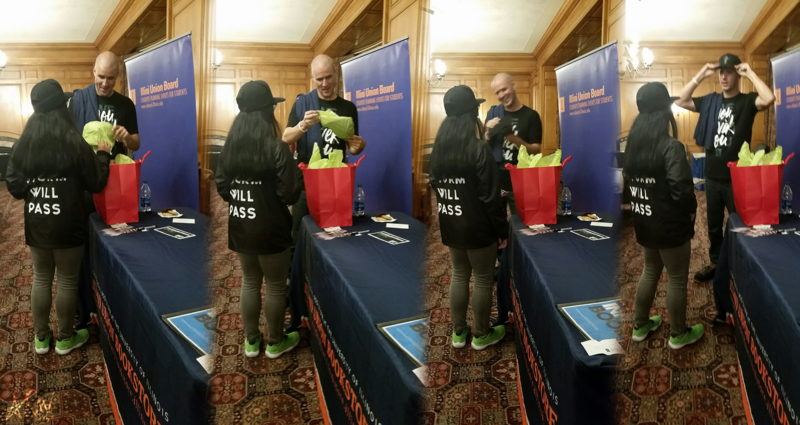 I had decided weeks beforehand what outfit I would wear to the event: an all-black Bulls snapback by Mitchell & Ness, my TWLOHA Herald T-shirt, a pair of jeans, and my neon green Jordan Futuras. But when the day of the event arrived, I realized I should probably wear a hoodie or jacket of some sort. It’s not that it was a cold day. Rather, it was actually a pretty warm day for November, but, come nighttime, surely it’d be cool enough that my arms should be covered. So I decided it would either be my TWLOHA Title rain jacket or my TWLOHA Love hoodie. I decided on wearing my jacket, and I’ve never been as happy to wear that jacket as I was that day — which says a lot because, the morning that jacket came in the mail, it was raining, and I was thrilled about the perfect timing of its arrival. But I say that because Carly, who had the fortune of eating dinner with Jamie because she was on the One Book One Campus committee, told me before the lecture began that Jamie was wearing his rain jacket. i finally bought that all-black Yankees hat. It’s a little too big and i guess i was feeling kinda hip-hop, so i wore it a little crooked for my last few hours in the city. If You Feel Too Much has a bunch of funny little moments, and that particular one is a favorite of mine. When I learned Jamie would be coming to U of I, I decided I wanted to get him a gift. Jamie’s a big basketball fan like I am. It’s another reason why I think he’s so cool, but we aren’t necessarily fans of the same teams. We’re both Kyle Korver fans, so we both support the Atlanta Hawks. I don’t primarily support the Hawks like Jamie, though. The Bulls are my team, and they always have been. I thought it’d be amusing to shove my Bulls fandom in his face, so I bought him an all-black Bulls snapback by Mitchell & Ness. I had been wanting an all-black Bulls hat, though, so I got one for myself, too. I figured if he had previously bought himself a Yankees hat despite not being a baseball fan, then he’d have to somewhat like a Bulls hat. Besides, I find it difficult to believe that any true basketball fan isn’t, at least, a slight Bulls fan because Michael Jordan is too great of a player to not like them. Because I got Jamie that same hat, I wore mine to the event so we could have our matching hats. But Jamie and I were also wearing matching jackets, and I had never been so excited to match someone as I did in that moment. I was the last person out of the UChapter members present to get her book signed by Jamie because I had my gift for him and the group’s gift basket and thank you card for him. So before I had him sign my book, I gave him this large red gift bag with volt green tissue paper sticking out of it. The red and volt green color scheme was purposely chosen by me because those are Hawks colors. Since then, I’ve been making a list of Jamie’s favorite snacks and such so I can give some of them to him whenever the next time I met him. But because he was coming to my school, though, I wanted the gift basket to be from the whole UChapter. Among the food items in the gift basket were Keebler Fudge Stripe cookies, a bag of Sour Patch Kids (which had candies two-times bigger than normal, something Jamie pointed out excitedly), a bag of Starburst minis, and a whole bunch of Fruit by the Foots. To make it a little more Illinois-themed, there was also a Nike Illini T-shirt and a gift card to Portillo’s. I didn’t know when the next time Jamie would be in Illinois would be, but I figured he’d find his way back in the state and would have the chance to try out Portillo’s. 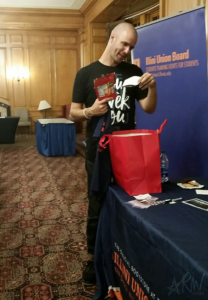 Jamie told me and the rest of the UChapter that he has received many gift baskets or things similar to them, but he said the one we gave him was the best one yet. In that moment, I was reminded of why I love to give people presents: You can show someone just how well you know him or her, making the person ridiculously happy in the process. After picking out all the things included in the gift basket, I told him there was still something else in his gift bag, but that the gift left in there was specifically from me. “It’s kind of a joke, but not really.” I wanted to make sure he knew I was disregarding his actual basketball fandoms. The snapback was wrapped in tissue paper, so it was pretty obvious what it was. “I think it’s a hat!” Jamie said, laughing. I made sure to point out to him that the hat was actually lined with fleece, making it perfect for typical cold Chicago weather. “So it’ll keep me warm, and I’ll fit in? !” Jamie sounded as if he liked it. He also mentioned that he now had a Bulls hat to sport if they ever won a championship, so he could then jump on the bandwagon. I typically frown upon bandwagon fans, but I’d make an exception for Jamie. “I’ll allow it,” I told him, confirming it’d be okay for him to jump on the Bulls bandwagon if that’s ever the case. I figured I was qualified to do so considering my status as a diehard fan of theirs. I also told Jamie we could now match because we had the same hat, and I was also sure to point out we had the same jacket, too. He went on to wear the hat, mentioning he felt hats are better if you have hair, and it caused everyone to laugh. He even put his jacket back on so we could match for the photo we were going to take together. Me being me, I also requested we take another photo: one where with my brand new Kyle Korver Hawks jersey. The first time I met Jamie, I brought my Kyle Korver All-Star shirt, and we took a photo with it, so I wanted to somewhat replicate the photo this time. “We’ve got to represent our boy!” I told Jamie right before the photo. The UChapter took a group photo with Jamie after he signed my copy of If You Feel Too Much. We had a bit of trouble trying to organize ourselves, trying to figure out who should stand where and how. Someone suggested she could go to the front and do the sorority squat if necessary. We all let out a good giggle. Carly decided to move to the front to better accommodate everyone else, so she stood in front of me and squatted a little to prevent blocking anyone. But Jamie’s smart. He said someone could just stand right in front of him because he’s tall, and he was right. When we left the event, Carly told me and Amanda she was surprised she was short enough to stand in front of Jamie without actually blocking him. The employees running the event were around us all when we were taking the group photo. One of the employees was taking the photo, and a bunch of the other employees exclaimed, “Aww, that’s so cute,” while we were posing for it. Jamie was amused. As Amanda, Carly, and I were packing up our things and cleaning up the information table we set up, Jamie came over to us. “You have to to accept this gift,” he insisted, referring to the three cookies he had from the refreshment table. He added that we could re-gift them if we wanted, but we had to accept the cookies. We, of course, did and were in no position to give away the cookies Jamie just gave us. We could now say Jamie Tworkowski gave us cookies, and who else could honestly say that? Amanda, Carly, and I proceeded to text, tweet, Facebook message, and Snapchat one another about the fantastic night we just had. I, in particular, ended up talking to Carly abount it for almost an entire day. We had been communicating on and off about meeting Jamie and the event until around 7 p.m. the following night. When I got home, I couldn’t go to sleep until 2 a.m. I felt too elated to go to bed. For a good 10 minutes after plopping onto my couch, I was continually saying, “I’m so sad!” because I didn’t want the night to end. I also realized how much I want to be best friends with Jamie. Amanda and I were friends with Carly before we joined the UIUC UChapter, but our friendship definitely grew once we were all in the club together. And my life, as a whole, became so much better once I did, too. I’ve met some great people because of it, and we’ve grown to become this cohesive group of individuals joined by a common interest, and it’s all because of Jamie. If it weren’t for him, we wouldn’t have our great group of people doing its best to spread TWLOHA’s mission, befriending one another in the process.